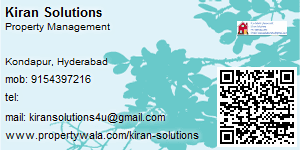 Kiran Solutions Deals in all types of Residential and Commercial Properties across Hyderabad. Kondapur is surrounded by restaurant, petrol pump, bank, park, office complex, metro station, higher education school, play school, hospital, train station, play school facilities and ATM. Address: Raghavendra colony, Kondapur, Hyderabad, Telangana, India. This Broker Profile page for "Kiran Solutions" has been created by PropertyWala.com. "Kiran Solutions" is not endorsed by or affiliated with PropertyWala.com. For questions regarding Broker Profiles on PropertyWala.com please contact us.